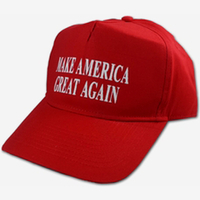 $60/DZ MAKE AMERICA GREAT AGAIN RED BASEBALL STYLE CAP. embroidered. AS WORN BY THE DONALD.